Graham Westley speaks during his first press conference as Posh manager. Photo: Joe Dent/theposh.com. New Peterborough United manager Graham Westley has urged the club’s fans not to pre-judge him. The instant reaction to Westley’s appointment, when the news was broken on the Peterborough Telegraph website yesterday (September 20), was largely negative, particularly on social media, but the 47 year-old is convinced the side’s results and performances will soon have everyone on his side. New Posh boss Graham Westley is flanked by chief executive Bob Symns (left) and director of football Barry Fry (right). Photo: Joe Dent/theposh.com. Westley cruised through his first press conference as Posh manager, confidently fielding questions about his preferred style of play, his alleged eccentric training methods as well as the unflattering comments that accompanied his arrival. He also deflected suggestions that there could be a personality clash with his chairman. The new manager will keep Grant McCann as first-team coach. The pair will take the Posh reserve team for a friendly at Norwich tomorrow (September 22). “I’m thrilled to have this job,” Westley announced. “It’s a great opportunity for me at a fantastic club. “This club has had phenomenal success in recent seasons and there is no reason why we shouldn’t have more. Obviously we have improvement to find, but there can’t be too many League One clubs that haven spent over £4 million on their squad. We had £1.5 million worth of talent come on from the substitutes’ bench at the weekend. “I watched the Southend game by chance recently and I have watched the last two games by choice. I have seen some very talented players turn in good performances for Grant McCann. “Grant has given the side confidence. He has got them passing the ball, over 500 passes in the last two games, and it’s not a question of me being forced to keep Grant at the club as I want him here. “He was a crafty. experienced player with an excellent football brain. Sometimes a new manager brings in his own staff and you immediately lose the link between you and the players. Grant’s team picked up four points in two games and two points a game wins you automatic promotion. “We have spoken and there is very little difference with how we view football and how it should be played and I would ask the Peterborough fans to judge me on what thay see from my team. Talk can be cheap. Some of the things said about my methods are myths. The suggestion that my players work 9-5 every day is a myth, albeit one that helped my Stevenage team win many games. “Whatever cyncism and scepticism there is about me will hopefully change when people see the drive, verge and energy from my team. Fans shouldn’t judge me on what they think I’m about, they should judge me on what they see from the team. Actions will always speak louder than words. “I have had lots of messages from Stevenage fans since the news broke that I was coming to Peterborough. They have thanked me for the entertainment, the goals and the trophies we enjoyed together. “I want the same here. We want to deliver exciting football, goals and wins. I pride myself on finding a way to win football matches. It’s not an easy thing to do at any level. “I have had an amazing last few days. I had a nine-hour flight to see the chairman, a 15-hour talk with him, and then a nine-hour flight back. We have been enjoying daily trans-Atlantic conversations as well. “Some people told me that the chairman can be difficult to work with, but what I see is a man full of enthusiasm and full of passion for his club. His knowledge of the game is vast. Of course he will have his input, but it will be input that still allows me to manage. “I love his ambition as well as his passion. He is an inspirational man and as he has helped assemble so much talent I don’t have a problem with him expecting us to do well. I’d be surprised if we are not there or thereabouts towards the top of the table by the end of the season. If we’re not I’ll probably be sacked! “He is undoubtedly a strong chairman and I wouldn’t have it any other way. 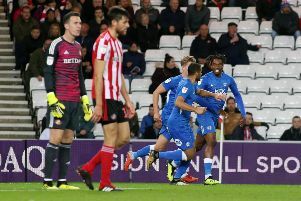 Posh have appealed against the bizarre red card received by midfielder Jermaine Anderson during the 1-1 League One draw with Walsall on Saturday (September 19). Anderson was sent off after accidentally throwing a water bottle into the crowd.